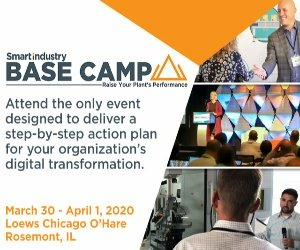 “We can’t bring The Connected Enterprise to life unless we can address specific opportunities to save time and money,” said Blake Moret, president and CEO of Rockwell Automation as he discussed the tactics required to achieve digital transformation. Read more. Infrastructure-as-a-Service (IaaS) helps industrial organizations to convert capital investments in servers, switches, cables and other network components into a more readily manageed operating expense. Read more. Land O’Lakes Maintenance Manager Nikolas Paris explained how modernizing the company's control and information system helped bring them into the current millennium. Read more. Internet of Things (IoT) technologies help executives secure assets, business systems, and employees. When problems arise, preventive actions occur immediately and long-term solutions are implemented—quickly and cost-effectively. Read more. "The challenge was to integrate the plant’s MES with ControlLogix to boost inventory accuracy. We were able to increase inventory accuracy to almost 100%." Nukon’s Geoff Nunan on a recent controls modernization and MES implementation at an Australian winemaker. Read more. What makes for better batch management? Organizations that abandon their rigid systems and instead embrace today’s rapidly advancing technologies and modern batch management approaches stand to uncover new competitive advantages. Rockwell Automation's Dan UpDyke explains how. Read more. Attendees of this week’s Rockwell Automation TechED event are no strangers to the Industrial Internet of Things (IIoT). Indeed, automation and controls professionals represent “where the IIoT rubber meets the manufacturing road.” Read more. Industry leaders launch partnership to upskill 1,000 military veterans annually for leading-edge digital manufacturing roles. "This groundbreaking program will help solve a challenge critical to fueling the future growth of the manufacturing sector." Read more. First Solar's objectives are to simplify the data collection process and to increase scale and reduce costs using secure cloud infrastructure. "You'll see enterprise, maintenance, supply chain…everything in the cloud." Read more. Fit-for-purpose functionality and thin-client interfaces accelerate implementation time for manufacturing execution systems (MES). Incremental functions can be added in phases to deliver compounding benefits. Read more. Remote Monitoring and Analytics Services from Rockwell Automation consist of cloud-based diagnostics designed to help users avoid failure and keep running as long and continuously as possible. Machine learning-based agents alert users of the service to imminent failures. Read more. FactoryTalk Analytics for Machines helps OEMs differentiate their systems and provide incremental value for their end-user customers. "The relationship between OEMs and end users is evolving into a partnership for production." Read more. Copilot Jeff Skiles believes training and procedures implemented as part of the airline industry's maturing safety management systems played a major role that fateful day in January 2009. Read more. Legendary Tennesse distillery upgrades its production network and reduces downtime with Converged Plantwide Ethernet (CPwE) strategy from Cisco and Rockwell Automation. Read more. Plants often have much of the information they need to improve operations and prevent downtime. But it often remains in siloed databases and uncollected from instruments--hidden and unused. Read more. Comprehensive, automated asset-management programs are designed to help manufacturers improve decision-making across the lifecycle of devices. Read more. Givaudan upgrades a former patchwork of HMIs with thin-client interfaces. "ThinManager's remote Shadow feature allows us to see displays from anywhere in the world." Read more. Many safety teams still rely on antiquated data-collection and reporting techniques. Fortunately, The Connected Enterprise provides an opportunity to close this disparity. Read more.